For a little over a year, from spring-summer 1825 to August-early September 1826, Berlioz was forced for reasons of economy to leave the rive gauche and seek lodgings near the western end of the Île de la Cité, in a small room on the fifth floor of a flat at the corner of rue de Harlay (no.27) and the Quai des Orfèvres, very near the Pont Neuf. A passage in the Memoirs (chapter 11), cited in the page on the Pont Neuf, refers to this. The move from 79 rue Saint-Jacques took place at some unspecified time during the spring or summer of 1825, and the address 27 rue de Harlay is first found in a letter dated 14 December 1825 (CG no. 41). The following year Berlioz was able to move back to the rive gauche to 58 rue de la Harpe. It was during his stay at rue de Harlay that Berlioz wrote most of the music for his first opera Les Francs-Juges. The building at 27 rue de Harlay is no longer extant. 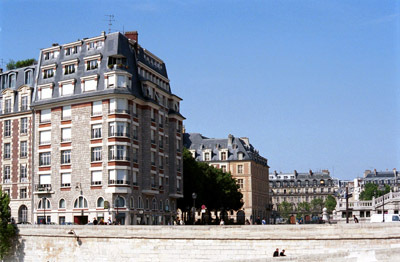 The photograph below shows the present site, seen from across the Seine; all the buildings along rue de Harlay are now modern. 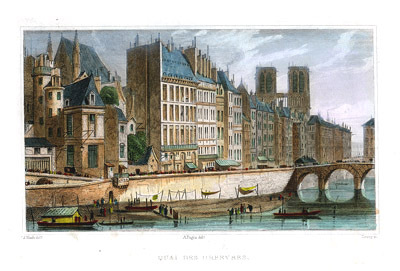 The engraving below, from our own collection, shows a view of the Quai des Orfèvres from the Pont Neuf as it was in the XIXth century ; the rue de Harlay is on the left, just off the engraving. The photograph reproduced on this page was taken by Michel Austin; the engraving is in our own collection. © Monir Tayeb and Michel Austin. All rights of reproduction reserved.